More than an ordinary glass company, our business delivers what you want, when you want it. Count on Aetna Glass Company for custom-built glass, and mirrors that arrive to your business on time and without a scratch. We believe that safety, efficiency, and profitability are your main concerns when purchasing and stocking glass products. Contact us to find out how our superior products can increase your company profits and protection for your employees. Aetna Glass continues to prove itself as an industry leader by offering customers the widest variety of packaging options as well as the shortest lead time in the industry. Aetna Glass houses over 2 million square feet of custom pre-cut glass at any given time. Our Texas and Tampa Locations are also equipped with high speed Straight-Line Bevellers as well. 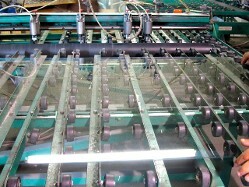 Aetna Glass uses the highest quality glass cutters to ensure our customers satisfaction. In total, Aetna Glass currently operates with 14 Strip Cutters, X Y setups, and 10 high-speed washers between its 3 primary locations. Aetna Glass continues to lead the way in developing innovative product packaging to meet all of our customer’s needs. We understand that different types of business require different types of packaging. Aetna’s Custom Built Wood Stick 50 Sq. Ft. Box is the perfect compliment to our current All Corrugated 50 Sq. Ft. Box. Aetna Glass locations (Texas & California) are conveniently located right next to our Wood Fabricating plants to cut down on lead times, and offer various packaging options to our customers. 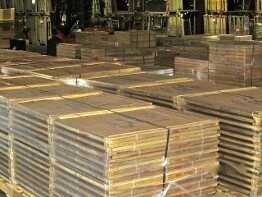 Kingsburg Box Company supplies Aetna Glass in Bloomington, CA with packaging products. Corsicana Box Company is responsible for supplying all of Aetna Glass Company (Texas & Florida) with custom wood stick boxes and wooden shipping containers. The majority of Aetna’s Hardware customers request custom-built wood stick boxes, which allows for more Safety, as well as Efficiency. Safety: Aetna’s wood stick packaging not only helps protect the glass during transit, to cut down on breakage, but also offers additional protection for the people handling it. Efficiency: Aetna Glass’ corrugated and wood stick boxes are 100% recyclable. They may also be broken down and used for other in store packaging needs. As we all see the cost of Energy and Transportation becoming a large part of our current expenses, having multiple ship points has proven to be beneficial to both Aetna, as well as its customer base. 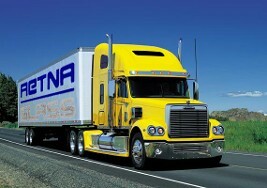 Aetna Glass delivers all the way from Full Truckload quantities, to larger production customers, all the way down to its LTL customers, making as many as 3 stops per load in order to help manage On-Hand Inventory and Cash Flow for all of its customers. Contact us to see tangible differences in company's profit margin with our products and services.